First, it’s all music, all the time. Second, it’s friendly. There are just shy of 650,000 residents in Nashville proper, according to the latest census data, but the city residents are still small-town charming. Third, the trendy, upscale restaurant Husk is just one of a bevy of new hot eateries in Nashville, illustrative of the robust growth the city has seen of late. Indeed, the Nashville region has been growing steadily over the past decade and is expected to continue to do so over the next couple of decades, according to estimates from local economic planning boards. Also, and most appropo, the exchange at the end of lunch at Husk demonstrates how Nashville is increasingly becoming a city of entrepreneurs. It is one of the most popular cities for millennial entrepreneurs, according to a recent survey conducted by Thumbtack, a consumer-service startup. So what is it about Nashville? Nashville’s nickname is Music City and for good reason. There’s live music everywhere, all over town -- even in airport bars. It’s the home of the music fest Bonnaroo, along with the Country Music Hall of Fame and many of the producing and recording industry giants all have offices in downtown on what’s called “Music Row.” “I was a bit surprised once I got outside of Nashville to learn that not everyone can play guitar,” says Chris McMurtry, the CEO and founder of Dart Music, a music-technology startup that distributes classical music. While Nashville is a natural petri dish for music startups, the benefits of launching in the capital city of Tennessee go beyond the cultural legacy and corporate history of music. Most notably, there’s no state income tax in Tennessee. (It does have a “hall tax” on dividends and interest.) For entrepreneurs counting their pennies, that’s an attractive draw. 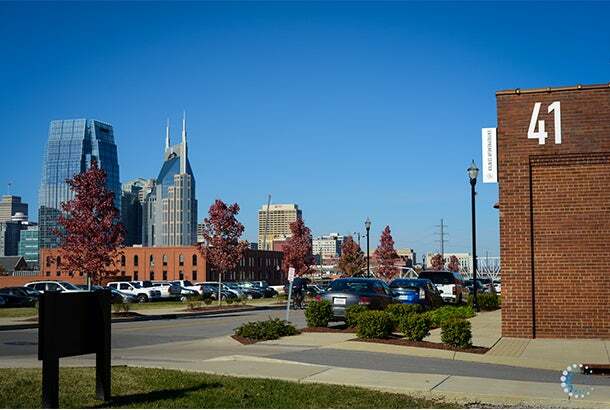 Nashville is arguably the capital of the healthcare industry in the U.S., serving as headquarters to some of the largest health-care businesses in the U.S. like HCA Holdings Inc. and Saint Thomas Health Services. Entrepreneurs tend to cluster around and be supported by the money and mentorship provided by large, legacy businesses, meaning the city is a hub for health-care innovation. 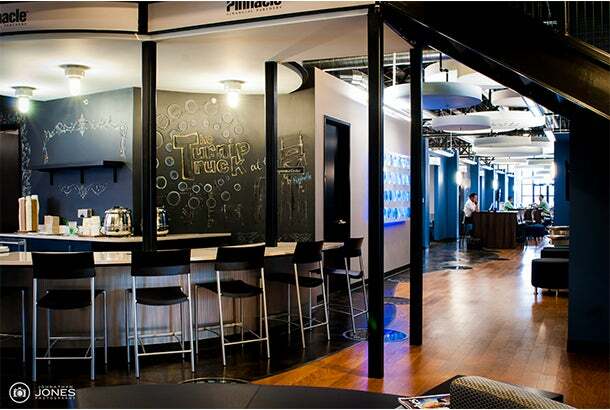 Inside the collaborative space at the Nashville Entrepreneur Center. Also, housing in Nashville costs a fraction of what it does in the major startup hubs in the U.S: San Francisco and New York. That’s welcome news for any bootstrapping entrepreneur -- but this inexpensive lifestyle may not last long. While Nashville is still relatively affordable, housing costs in Music City are on the rise. One byproduct of the booming population growth Nashville is experiencing is it’s the third hottest real-estate market in the U.S., only trailing Denver and San Antonio, according to a report from Auction.com. When it comes to stoking a fire of entrepreneurship, it’s game over without smart people. University talent is a feather in the cap of Nashville’s entrepreneurship scene. Vanderbilt University is the most prestigious college in town, but there are another 20 schools of higher learning located in Nashville. Often, people stay living and working where they go to college, and that’s one reason why Nashville has become one of the U.S. cities with the fastest rates of growth among young people, defined between the ages of 25 and 34, between 2000 and 2012. That pool of talent hasn’t gone unnoticed. Eventbrite, the live event marketplace, has about 100 employees in Nashville, its second largest corporate office outside of its San Francisco headquarters. When Eventbrite was looking to open a second office, its short list of finalists included Salt Lake City, Denver, Austin and Nashville. Ultimately, Eventbrite was wooed by the engineering talent in and around Nashville, says the Julia Hartz, the co-founder and president of Eventbrite. The more nuanced reasons that Nashville is becoming a popular entrepreneur city are just as important. The friendly waiter at Husk isn’t the exception to the rule. In Nashville, being friendly is the rule. It recently ranked no. 4 in Conde Nast’s most friendly city survey. For an entrepreneur looking to build a business network, that spirit of generosity means you can probably get a coffee with just about anybody in town. For entrepreneurs willing to hustle, the Nashville sense of community, camaraderie and friendliness opens some big doors. “We couldn’t have done this anywhere else just because people will actually give you the time of day. We have met so many people who don’t need to talk to us,” says Mackenzie Stokel, COO and cofounder of EVAmore, a recently launched platform helping event planners identify and book independent bands. “It is just insane to me the community here,” adds Channing Moreland, the CEO and other co-founder of EVAmore. To be sure, Stokel and Moreland, who are both still in college and expect to graduate with their bachelor's degree in 2016, have been given a helping hand in meeting people because they were part of the first class of the Project Music Accelerator Program, a program run by the Entrepreneur Center designed to help and nurture music tech startups. Despite the recent entrepreneurial energy, there are still reasons why Nashville remains a smaller-tier startup community, compared with the likes of New York and San Francisco. “We like to say we are the Silicon Valley of music,” says McMurty. But at the same time, he is aware that one of the biggest differences between San Francisco and Nashville is that The City by the Bay has a lot of tech giants -- think Google, Facebook and Apple, to name a few -- both to lead by example and to provide mentorship.